Transition Town, it will be the season finale for Awareness Film Night. This visually stunning film offers a refreshing take on the importance of local communities in shaping happy, healthy futures. The film connects the dots between climate chaos, economic meltdown and our own personal suffering – stress, loneliness and depression. 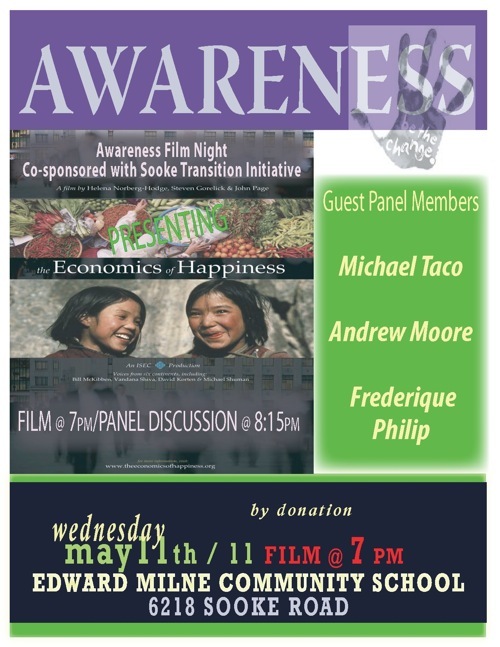 Following the film there will be a panel discussion with Michael Tacon and Andrew Moore, two of the Sooke Transition Town initiators, Frederique Philip, co-owner of the Sooke Harbour House and John Horgan, our local MLA. The screening will be held at the Edward Milne Community School theatre, 6218 Sooke Rd. in Sooke at 7 p.m. Admission is by donation.